The Fugees's Pras Michel will be Tom Needham's special guest this Thursday at 6 P.M. on WUSB's The Sounds of Film. Stony Brook, NY - March 1st, 2016 - The Fugees's Pras Michel will be Tom Needham's special guest this Thursday at 6 P.M. on WUSB's The Sounds of Film. 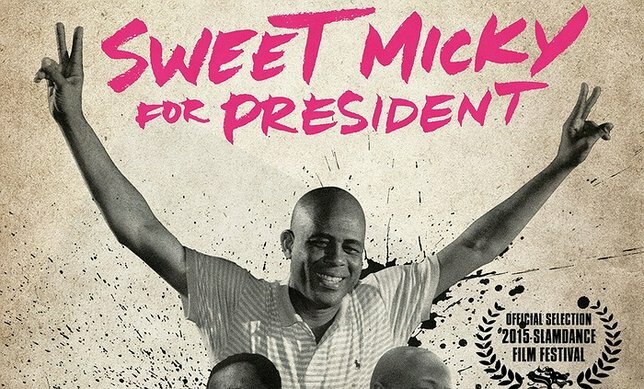 The two-time Grammy-winning rapper will be discussing his film Sweet Micky For President, which is part of the Port Jefferson Documentary Series on March 14th. The film follows Pras as he returned to his homeland of Haiti post-earthquake. After being unimpressed with the corrupt government, he decided to mobilize a presidential campaign featuring the unlikeliest of candidates: Michel Martelly, otherwise known as "Sweet Micky," one of Haiti's most popular pop stars. Pras will also be talking about what happened when Pras' former band mate, superstar Wyclef Jean, surprised everyone and entered the presidential race too. Throughout the interview, Pras shares incredible stories about his adventures with Sean Penn, President Bill Clinton and Warren Beatty. Pras states," The most important thing to come out of this whole experience is to realize how much power people really have. People just don't understand how much change they can make when they share a common cause." Also on the show, is the best-selling author of Confessions of an Economic Hit Man, John Perkins. He is out with a new updated version of the book called New Confessions of an Economic Hit Man. The book is an autobiographical tale about his role as an "economic hit man" who would convince leaders of underdeveloped countries to accept substantial loans for construction and engineering projects in exchange for U.S. influence in the region and access to their natural resources. He explains that when countries ultimately couldn't pay back their debts, they would be forced to privatize their nation's assets or risk a military engagement. In 2009, his documentary, also called Confessions of an Economic Hit Man, was shown at festivals all over the world. He also appeared in a number of other documentaries including Project Censored the Movie, American Empire, The End of Poverty? and Zeitgeist:Addendum. John Perkins will be doing a book signing on March 7th at 7 PM at the Rare Book Room at the Strand Bookstore in Manhattan. Perkins warns,"We have to really change our ways. So many businesses are making huge amounts of money in the conflicts in the Middle East and Africa, and so much of why we go to war is because these corporations really want to increase their business portfolios." In addition, Tom Needham will be joined by Hollywood film composer, Hanan Townshend. Originally from New Zealand, Hanan now lives in Austin, Texas. He got his big break when he became a music licensee on Terrence Malick's Palme D'Or award-winning film, The Tree of Life. Since then, he has worked with Malick again on To the Wonder and Knight of Cups. The Sounds of Film is the nation's longest-running film and music radio show. For over 28 years, the program has delivered a popular mix of interviews and music to listeners all over Long Island, parts of Connecticut and streaming live on the internet. Recent guests include Dr. Cornel West, Spongebob's Tom Kenny, Jim Breuer, Big Daddy Kane, Congressman Steve Israel, Cicely Tyson and composer Carter Burwell. Take the Train to the Game to Catch the Yankees in 2014! Subject: LongIsland.com - Your Name sent you Article details of "The Fugees' Pras Michel and Confessions of an Economic Hit Man's John Perkins Interviewed by Tom Needham on The Sounds of Film"